We are proud to publish our inaugural quarterly e-newsletter with original contributions from many of our members. We encourage all members to submit for future additions. Topics include but are not limited to educational, community focus, interesting cases, resident and student section, and adventures abroad. How Do You Motivate the Residents to Scan More? “POCUS – A Love Story"
Welcome to our new AAEM-EUS Secretary/Treasurer! Kristine S. Robinson currently serves as an Assistant Professor and Emergency Ultrasound faculty member at the West Virginia University (WVU) School of Medicine in Morgantown, WV. She completed her emergency medicine training in 2008 at Geisinger Medical Center in Danville, PA. Afterwards, she spent time as a locum tenens and community-based emergency physician prior to returning to WVU in 2015 to complete an ultrasound fellowship. After fellowship, Dr. Robinson joined the faculty at WVU, helping to develop the ultrasound programs at the community-affiliated practice sites before transitioning to a role focused on ultrasound research and residency education in 2017. First and foremost, I would like to thank our board of directors and membership for helping found our section. We are a passionate group of ultrasound enthusiasts who are eager to share our fervor with all AAEM members. We hope this newsletter will serve as a means to disseminate ultrasound education and to stimulate dialogue regarding topics pertinent not only to the practice of point of care ultrasound but to emergency medicine in general as well. We are optimistic about the future direction of our section with plans to expand our website with educational content, develop a recurring editorial section in Common Sense, and broaden our didactics at future Scientific Assemblies. We welcome all AAEM members interested in ultrasound to join our section and encourage original contributions and participation. Finally, we owe much gratitude to Darcy Welsh and Ginger Czajkowski for their incredible work and dedication to our section. Without them, none of this would be possible. And now without further ado, please enjoy our inaugural "The POCUS Report." As the inaugural chair for the EUS-AAEM Education Committee, I am very excited about our plans for this upcoming year. We will focus on developing educational opportunities for AAEM members in all levels of training. We look forward to working with the Social Media Committee on several projects, including this quarterly e-newsletter, which will feature interesting cases, reviews of ultrasound topics, journal club reviews, and editorials; as well as expanding our website by developing an online collection of educational ultrasound videos, case challenges, and resources for our AAEM members. Our most important focus for this year will be the 24th Annual AAEM Scientific Assembly. We plan to expand the ultrasound content offered to include the pre-conference courses and an ultrasound track with discussion panels, small group hands-on learning, and Pecha Kucha sessions. We welcome suggestions and encourage AAEM members to reach out to us with didactic and workshop ideas for future assemblies, as well as original contributions to this newsletter and our evolving website. Do they have the basic skills down? It is that time of the year when we have a fresh crop of interns roaming the emergency department (ED) halls. Although the integration of ultrasound (US) into undergraduate medical education is becoming popular, not all programs are created equally.1-3 The residents may lack the skills and confidence to strike out unaided to use the US machine. 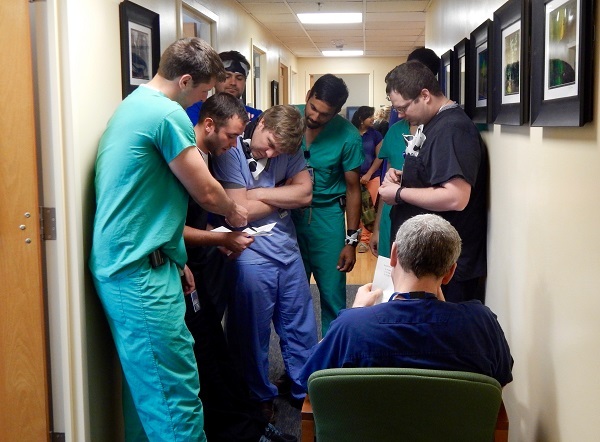 Many EM residency programs have a month of orientation lectures for interns, and those with strong US presence incorporate lectures and workshops on basic Point-of-Care Ultrasound (POCUS). Options for additional training include pairing a senior resident or US faculty with an intern for scanning shifts throughout the year. Attending providers or senior residents should also be present when the interns are performing their ultrasound procedures for the first three to six months to ensure proper technique and instill confidence. Do they have enough time to scan? Residents often tell me that time constraint is one of the biggest problems holding them back from scanning more often. Why spend the time performing an echo on a patient with syncope and chest pain whom they know will get admitted? Instead, why not use that time to see one more patient to help unburden the overcrowded waiting room? Although a valid point, the residents need to understand that to become faster and more efficient at obtaining proper US images, they need to practice. To practice, they need to be provided with protected time, especially during their first two years. A simple method to combat the “time issue” is to enforce taking the US machine into the room when first seeing a patient with a chief complaint that is suitable for scanning, e.g. right upper quadrant pain. This may be met with reluctance, but when those gallstones are visualized within five minutes and the disposition made, the residents will see the value. 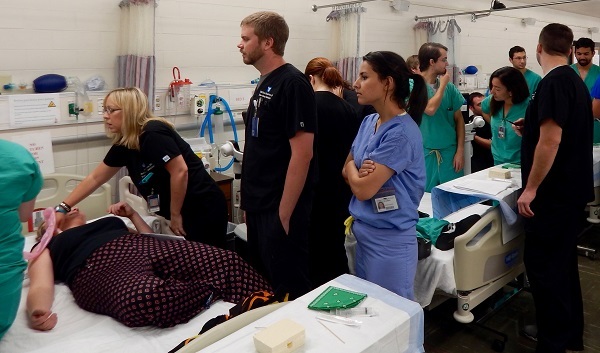 As they transition into their third year, they should be focusing on when to selectively use POCUS to enhance patient care and expedite patient disposition while managing a full load of patients. Is it fun? Let’s face it. It is difficult to motivate a resident who thinks scanning is a chore or a burden. What if you make it into a game? 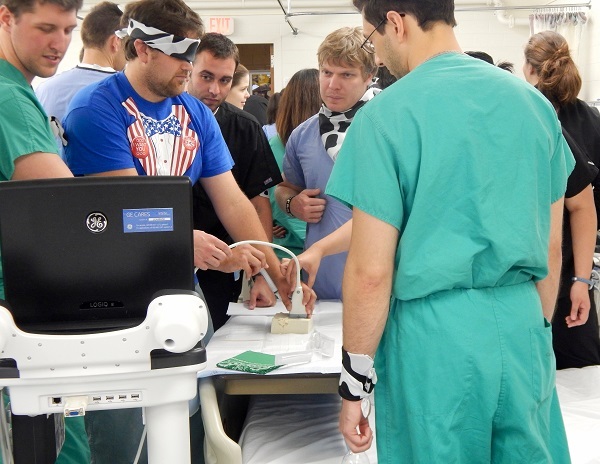 Your group can organize US-related competitions where your residents test their knowledge and POCUS skills. If other departments in your institution, such as internal medicine and general surgery, have integrated ultrasound into their programs, then you can have an interdepartmental US tournament. Another option is to contact neighboring EM residencies to join the fun. The Society for Academic Emergency Medicine and the American Institute of Ultrasound in Medicine hold SonoGames4 and SonoSlam, respectively, during their annual meetings. Both of these are excellent venues for residents to compete. In addition, acknowledging great US cases and images monthly is a great way to enthuse your residents. You could also recognize and celebrate the resident who has amassed the most scans in a month. Are you giving real-time feedback? Wading through and evaluating the department’s US images for quality assurance (QA) is tedious, and many of us procrastinate in completing this task. Unfortunately, when residents do not receive timely feedback, they tend to disregard your constructive comments. Providing them with bedside feedback is best, since residents are more likely to remember those critiques and incorporate them into their clinical practice. QAs should be done at least monthly. Criticisms should be concise and clear. Take the time to show them how to correct their mistakes, and share tips that you have learned from your years of experience. To summarize, your ED needs to be a fun scanning environment. You alone cannot be the only proponent for POCUS. The residents require time and the skills to perform scans independently. They also need to believe that their images potentially make a difference. If you address these factors, your residents will blossom into proficient US scanners, and soon you will find yourself buried in US images for QA. Dinh VA, Fu JY, Lu S, Chiem A, Fox JC, Blaivas M. Integration of Ultrasound in Medical Education at United States Medical Schools: A National Survey of Directors’ Experiences. J Ultrasound Med. 2016 Feb;35(2):413-9. Patel SG, Benninger B, Mirjalili SA. Integrating ultrasound into modern medical curricula. Clin Anat. 2017 May;30(4):452-460. Bahner DP, Goldman E, Way D, Royal NA, Liu YT. The State of Ultrasound Education in U.S. Medical Schools: Results of a National Survey. Acad Med. 2014 Dec;89(12):1681-6. Lewiss RE, Hayden GE, Murray A, Liu YT, Panebianco N, Liteplo AS. SonoGames: an innovative approach to emergency medicine resident ultrasound education. J Ultrasound Med. 2014 Oct;33(10):1843-9. Starting an ultrasound (US) program at a community hospital definitely has its challenges. The most important aspect is gaining internal support from the emergency department (ED) administration and physicians. In a university setting, it seems to be fairly easy to get “buy in” from the physicians as Point-of-Care Ultrasound (POCUS) is becoming ubiquitous in this setting. I will focus on these internal challenges and most importantly the physician component. I work at a fairly “large” community hospital with 80 inpatient and 26 ED beds. We are blessed with an active and successful foundation that raises a great deal of funds annually. The ED was the recipient of funds about eight years ago and a portable ultrasound unit was subsequently purchased. Our staff is fairly diverse in terms of age and training, ranging from older, long term ED physicians that were never board certified but have greater than 30 years of ED experience to a few recent fresh residency grads. The exposure to US for most of our staff has been very minimal and limited to ordering formal studies for DVT, abdominal pain, and pregnancy complications. The “younger” group of ED physicians have had some experience clinically but not with an active US fellowship residency. Getting physician interest and support is absolutely the most important first step, otherwise, the program will never get started. Your ED needs a “champion” for sure. That person in our ED is me. I graduated emergency medicine residency in 2001 and had no exposure to POCUS. This was also about the time when FAST exams for trauma were in their infancy and not routinely taught in ATLS. My US experience after completing residency was minimal, accordingly, because US had not yet become a core aspect of emergency medicine. Even after the purchase of the US, it typically sat dormant for weeks, only being used to guide central venous access by a mere few that even knew how to use it. My figurative “love affair” with ultrasound occurred while attending a critical care conference lecture discussing the use of POCUS to diagnose and guide therapy in patients with CHF, sepsis and undifferentiated dyspnea. I was amazed at the utility of POCUS and specifically, echocardiogram/IVC measurements to assist in diagnosis of volume states. After that lecture, I was eagerly anticipating utilizing this new (to me) modality in assessment and treatment of critically ill patients. I reviewed further by reading critical care POCUS texts and watching dynamic video demonstrations of these concepts. Calculating EPSS and FS in estimating LVEF and measuring IVC diameters for volume state became my first objective. As I continued my research and study of POCUS, I became exponentially more fascinated by its expansive diagnostic utilities. I learned and utilized POCUS for ocular complaints, FAST/RUSH exams, abdominal pain, echo, arterial/venous Doppler and MSK. I documented and saved each and every exam I performed. As I performed more and more examinations, not only did I gain experience, but I also gained self-confidence and a renewed feeling of occupational “purpose”. Most physicians eventually suffer from perceived stagnation in our daily routine and this can be challenging to overcome. It’s definitely difficult to manage and interferes with our self-concept and overall mental wellness, at times. We often undervalue the complex critical thinking skills and vast knowledge that we have developed over our years of practice because it becomes so “routine”. Being able to adopt a fresh robust skill that greatly enhances our diagnostic skill and leads to efficient/directed care of patients is very personally satisfying. THIS concept should be the major focus of stimulating ED physician interest in your hospital. Having them experience that visceral “AHA” moment when a critical diagnosis is determined by using POCUS. I frequently take my coworkers with me to see positive exams and let them experience POCUS in action. I also try to “creep” on other physicians’ cases for the opportunity for me (and subsequently, them) to perform diagnostic US. First trimester pregnancy complaints are particularly satisfying for the physician, as well as the patient. This presentation gives the physician the opportunity to (ideally) alleviate significant patient stress with very little effort, resulting in significant level of fulfillment when positive results are obtained. Often this strategy will incite an evolution of interest and involvement that hopefully continues to broaden and decrease resistance to learning new skills. Starting an ultrasound program is definitely challenging, in many aspects, involving several departments and various hierarchical administrative groups within your facility. I hope to assist in dealing with these complications and provide strategies that have benefitted myself and my colleagues in the community/rural hospital setting. Log-in with your AAEM username and password to access AAEM Online! As I write this, I am five months away from presenting a curriculum on Point-of-Care Ultrasound (POCUS) to the Philippine Board of Emergency Medicine, hoping that it will be integrated into all of the accredited emergency medicine (EM) residency programs in the country. It has been a long and arduous process for our EM board to acknowledge the need for POCUS. The past nine years have been fraught with politics, budget concerns, territoriality, and cynicism. I have felt a constant need to validate the value of POCUS in emergency medicine as hospitals, other specialties, and even many of my EM colleagues have not always recognized or appreciated its value in our practice, thus I am grateful that we are finally at this point. I first became aware of POCUS back in 2007, during my second year as an EM attending at St. Luke's Medical Center in Manila. At that time, 95% of the United States’ EM residency programs had already integrated it into their training, 1 but none of my fellow EM providers in the Philippines were using it in clinical practice. The literature impressed upon me that POCUS is nothing short of magical; consequently, I knew that I had to train on it immediately. My first attempt at obtaining POCUS training was a failure, since the only training available in 2008, was a FAST preceptorship program being offered by a trauma surgeon at a Manila state hospital. As a prerequisite, participants were required to obtain a basic ultrasound (US) course certificate, but the only local course was being taught by the same surgeon, who required 30 participants, six ultrasound machines, and a fee of $25,000 (about $500) per head. None of my colleagues were interested. I asked one of the radiologists I knew to conduct an introductory ultrasound course for EM physicians. He bluntly declined saying that they do not teach “crash courses of the specialty”. I had the opportunity to register for a few emergency ultrasound courses abroad in 2009, the first being an E-FAST workshop in Singapore, which was bundled into an ATLS course. The second one was a WINFOCUS Ultrasound Life Support Course, also in Singapore. Afterwards, I attended Professor Daniel Lichtenstein’s Lung and Critical Care Ultrasound Course in Seoul, South Korea. Meeting fellow EM delegates from other countries who were passionate about POCUS and a one-on-one with Professor Lichtenstein inspired me to convince hospital management back home to integrate POCUS into our emergency department (ED) practice. My superiors were initially reluctant to the idea; hence our request for POCUS privileges was denied. Eventually in 2012, with the help of my department chair’s brilliant persuasion, the breadth of available literature on POCUS and its positive impacts in EM practice, and excellent leadership from our forward-thinking medical director, we finally obtained our US privileges and bought our first machine, a SonoSite Nanomaxx. That little ultrasound machine ended up saving hundreds of lives in our ED. We picked up dozens of ruptured ectopic pregnancies, Abdominal Aortic Aneurysms, pneumothoraces, Deep Vein Thromboses (DVT), and pericardial tamponades that could have otherwise taken longer to detect without our ED ultrasound. Furthermore, it helped gain interest among my physician colleagues who then sought POCUS training. We wrote protocols integrating ultrasound into our ED workflow. We came up with a very basic, yet effective, system of archiving scans, and we started teaching our residents and EM trainees from other institutions. We published POCUS studies that caught the attention of our EM board. Our ED became the first in the country to adapt POCUS into EM clinical practice. Sadly, we received a letter from the hospital’s Vascular Laboratory several months after starting our program. It stated that for safety reasons, only their specialists should be allowed to perform DVT scans and other related studies on patients. It also emphasized that their Vascular Medicine Consultants are USA-trained, boarded physicians and were not just certified from workshops. Apparently, one of our patients was found to have a DVT upon repeat scanning at the Vascular Lab, days after she was told in the ED that she had none. The letter hit me hard. I felt that for all the good our POCUS initiative had done, it would never be truly acknowledged, merely because we were not trained according to preconceived standards. That same day, I decided to enroll in a Visiting Fellow Program on Emergency Ultrasound at Mass General in Boston, Massachusetts. I worked with Dr. Vicki Noble in late 2013, on how to set up an EM US training program. In contrast to medical practice back home, I found Mass General to be a refreshingly collaborative environment where people collectively worked towards improving the patient experience. There was no grandstanding, credit grabbing, or upstaging. I also truly felt that everyone, particularly in Dr. Noble’s division, was genuinely concerned with providing the best possible educational experience for their foreign trainees. Most of all, I learned something very important from Dr. Noble that is now at the core of my POCUS credence: “Detractors will never care or accept where and how you got your training; it will be the patient outcomes that will silence them. So always make a point to continuously improve your skills, showcase successes, and make everyone aware of it. That’s when you start getting true validation.” With that, I found a renewed purpose and conviction to continue our department’s efforts to promote POCUS in the Philippines. Since then, we have further strengthened our ED ultrasound program with the addition of a new, more advanced machine provided by our medical center. We have held free basic POCUS workshops for EM providers every year, made POCUS visible in national meetings, introduced EM US to medical students, and have reached out to US organizations from neighboring Southeast Asian countries for collaborative training. Out of the country’s 14 accredited EM residency programs, five have already adapted the modality to their curriculum; others are expected to do so in the next two years. Our department is also on the verge of starting a project with the Southern Philippines Medical Center to train EMT’s on prehospital US, supported by a pioneering tele-ultrasound network in one of our country’s biggest cities in the south. So far, everything looks to be on track for making POCUS an EM standard of care. As I look back on the past nine years, I feel a sense of ease and remarkable assuredness that the next few years will be less daunting. We have paved the way in establishing that POCUS truly improves patient care in our country, and many more providers are joining the cause. Counselman FL, Sanders A, Slovis CM, Danzi D, Binder LS, Perina DG. 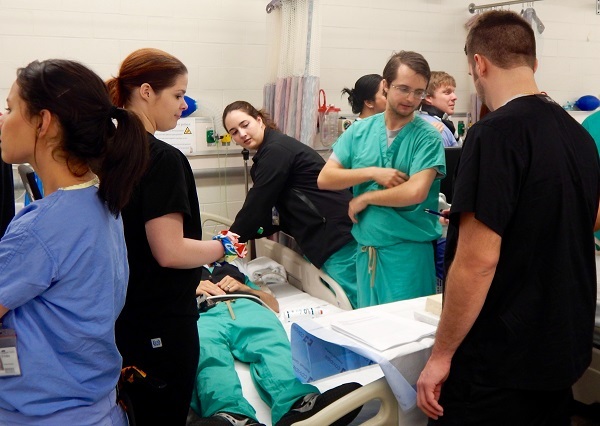 The status of bedside ultrasonography training in emergency medicine residency programs. Acad Emerg Med 2003; 10(1):37-42. Towards the end of my third year of medical school, I realized my love for emergency medicine. As I spent more time in the emergency department (ED), I realized something about myself; I did not know anything about ultrasound. Every shift I worked, a resident or attending physician would ask me to interpret or assist with a bedside ultrasound procedure. I remember standing at the bedside thinking how wildly unprepared I was for my upcoming ED away-rotations and sub-internships. I heard that my medical school had started integrating ultrasound into our academic curriculum, but to my disappointment, I missed the program by a year. I looked through our elective catalog and fortunately came across a two-week ED ultrasound elective which fit perfectly into my schedule. On the first day of the rotation, the instructor inquired as to how much experience I had with Point-of-Care Ultrasound (POCUS). I was quick to express my utter lack of knowledge, realizing I could not even turn the machine on. After a good laugh, we went over the basics. He was an amazing mentor, and I was inspired. Over the next two weeks, I dedicated myself to ultrasound. I read. I watched videos. I practiced my scanning and interpreting skills with one-on-one guidance. It was a wonderful learning experience, and I was amazed at how much knowledge and competency I had gained during such a short period of time. Even though it was only for two weeks, the rotation gave me a solid foundation and sparked a personal interest in POCUS. 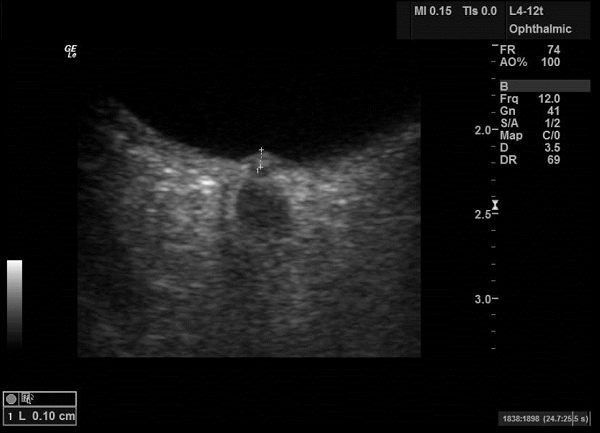 I became comfortable with ultrasound in a non-threatening environment, and it minimized the “intimidation factor.” When I started my intern year, the attending asked me to perform a bedside gallbladder ultrasound on one of my patients. I remember feeling an enormous amount of relief, thinking, I can do this, and I would not have to bother my senior residents. So, here is my advice to all medical students: seize the opportunity! Take the time to do a fourth-year ultrasound elective. I promise, you will thank me later. I have always been fascinated in global health, and when I started my emergency medicine residency, I wanted to make sure that I dedicated part of my time to cultivating that interest. My opportunity came in April 2017, during my third year. Through the West Virginia University School of Medicine Global Health Program, I traveled with a group of internal medicine providers to Nalerigu, Ghana to practice at the Baptist Medical Centre. Our schedule was structured so that we had daily ward rounds (male, female/family, pediatric, and maternity) then outpatient clinic on Mondays, Wednesdays, and Fridays. We typically saw between 50 to 100 patients a day. Like many of the hospitals in that area, Baptist Medical Centre had limited lab capabilities and therapeutic options. The only pain medication available that was stronger than paracetamol was tramadol, and at one point during the month, the hospital pharmacy ran out of ampicillin. Imaging resources were also limited; there was no CT or MRI, and the X-ray machine had broken six months prior with no repair date set. Luckily, SonoSite generously lent me an iViz ultrasound machine to take on this trip, and I found it to be an incredibly helpful diagnostic tool. Although I use POCUS within my emergency medicine residency training, I do not consider myself an expert by any means. However, out of all the providers, I had the most experience and, by default, became the ultrasound specialist. Other physicians, including surgeons, frequently asked me to review their images or scan patients they were concerned about. If an ultrasound probe could fit on the body part, I would scan it! I became increasingly excited about what I could do with the ultrasound and found myself immersed in pathology not often seen in the United States. I scanned a hematoma on a child’s occiput looking for a skull fracture. I scanned several head and neck masses. I helped diagnose tuberculosis, pneumonia, pleural empyema and effusions, multiple cases of cardiomyopathies, and pericardial effusions. I also recognized multiple abdominal pathologies using the iViz, including cholecystitis, hepatic carcinoma, appendicitis, fibroids, ovarian mass, molar pregnancy and missed abortion. Plus, without a functioning X-ray machine, the ultrasound became extremely useful in musculoskeletal complaints. I diagnosed a distal radius fracture and imaged several lipomas and sarcomas of the extremities. At night, I would practice on myself and my roommate to build my confidence and skills. I was a “scanimal” and probably amassed more than 300 images in a span of 30 days. This was an amazing feat since the machine typically overheated due to the daily temperature which averaged above 100˚F. I had about three minutes to acquire all my images before the machine would shut down, and it took about 5-10 minutes to cool down before I could use it again. I had to use my engineering background to come up with some creative ways to cool the machine down. The ultrasound gel also liquefied under the tremendous heat and needed to be frequently cooled to re-solidify. The entire experience was humbling. I realized the importance of ultrasound in clinical practice, especially in global health and when faced with limited resources. Before this, I had never considered doing an ultrasound fellowship, but now, I think it might just be my next step to succeed in my chosen niche. A 40 year-old female presented to the emergency department complaining of a headache. She reported four days of dull, constant left sided pain that radiated to the back of her head similar to prior headaches. She denied sudden onset of pain, fevers, neck stiffness, nausea/vomiting, vision changes, focal weakness or paresthesias. Past medical history was significant for pseudotumor cerebri, also known as benign intracranial hypertension. The patient denied any use of medications or illicit drugs. Physical exam showed an obese female in no acute distress, ncat, vitals within normal limits, with no neurologic or HEENT abnormalities. There was no rash or temporal artery tenderness. PERRLA/EOMI. Fundoscopic exam was limited at the bedside. Exam was otherwise unremarkable. An ocular ultrasound was performed. The image is below. What is the diagnosis? In a situation, where there is clinical suspicion for intracranial pathology part of the workup may require evaluation of intracranial pressure. One method used in the ED for direct measurement of intracranial pressure (ICP) is lumbar puncture, though it is invasive and has risks. CT and MRI are noninvasive options but there can be issues with radiation, delay in care, and cost. Traditionally, the simplest and least invasive marker of increased ICP has been papilledema seen on fundoscopic exam. The optic nerve sheath contains cerebrospinal fluid and communicates directly with the subarachnoid space so with increased ICP the nerve sheath expands. Eventually the optic disc bulges out into the vitreous chamber and is seen as papilledema. However, conducting a full dilated pupil exam in a busy ED is not always feasible and not all providers are comfortable relying on their fundoscopic skills to rule out papilledema. Bedside ultrasound in the hands of a trained operator can be useful to quickly determine if a patient has increased ICP and influence further decision making and patient care by allowing the provider to see papilledema without fundoscopy. The diameter of the optic nerve sheath is easily measurable with ultrasound and multiple studies have shown a widened diameter to be both sensitive and specific for increased intracranial pressure. This is important because widening of the optic nerve sheath is an earlier finding than papilledema, so by utilizing ultrasound, evidence of increased ICP may be seen sooner than with fundoscopy. Scanning the optic nerve sheath is also easily repeatable which is useful to evaluate response to treatment or in situations where ICP needs to be monitored for changes. Studies vary in the nerve sheath diameter used as a cut off for increased ICP however most use between 5 and 6 mm, conventionally measured 3mm posterior to the optic disc. Multiple measurements should be taken and averaged together to ensure an accurate diameter. When ICP is severely increased a “crescent sign” may be noted which is seen as circular echolucency within the optic nerve sheath. Papilledema is defined as elevation of the optic disc > 0.6 mm from the retina. The patient in this case had a previous diagnosis of pseudotumor cerebri with increased pressures on lumbar puncture. 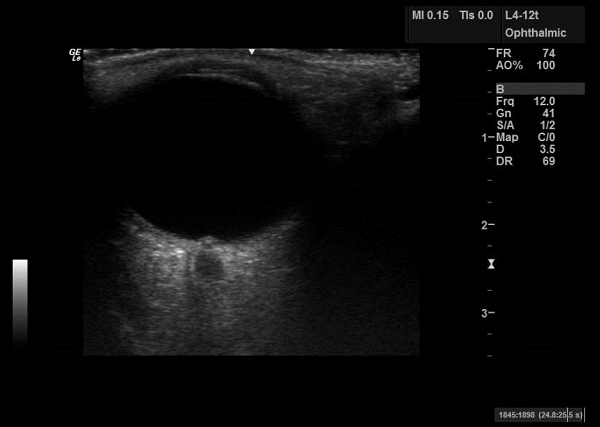 Ocular ultrasound showed her optic nerve to be >0.6 mm using multiple measurements consistent with papilledema. We were also able to visualize a crescent sign within her optic nerve, further evidence that her symptoms were due to increased ICP secondary to noncompliance with her acetazolamide therapy when she presented to the emergency department. The patient had an uncomplicated lumbar puncture for symptomatic relief and was restarted on her medications. No CT head was necessary given her known diagnosis and nonfocal neurologic exam.